1937 - Rev. A. G. Holbrook and family arrived in Fort William (now the southern half of Thunder Bay). He began holding meetings in homes, then in the old Post Office on May Street. Later the church moved to Cameron Street, and then to the Trades and Labour Hall on Finlayson Street. 1944 - The church moved to another location on Simpson Street. 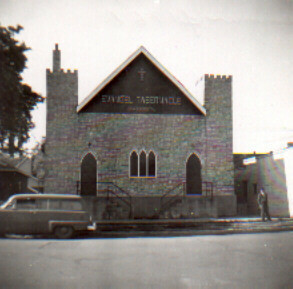 1950 - The congregation built a new building known as Evangel Tabernacle at 222 Leith Street just east of May Street (pictured). 1953 - Following the recommendation of Pastor Holbrook, the congregation affiliated with The Pentecostal Assemblies of Canada (PAOC). 1956 - Rev. Bruce Schwindt commenced his ministry as the pastor of Evangel. 1959 - Services were moved to the Odd Fellows Hall because of building structural problems at the building on Leith Street. 1963 - The church moved west into a more residential area of Fort William and bought property to construct a new building at the corner of Arthurand Kelly Street (pictured). 1965 - Rev. Garry Foreman began his ministry as the pastor of Evangel. 1969 - Rev. Doug Lindsey moved to Fort William to become the fourth pastor in the history of Evangel Church. 1974 - Rev. Reubin Drisner commenced his ministry at Evangel. 1979 - The Church bought property adjacent to Lakehead University in the Intercity area of the recently incorporated city of Thunder Bay and moved to its present facilities at 1260 Balmoral Street. 1981 - Rev. Wayne Parks began ministry at Evangel. 1985 - Rev. Gordon Krause became the new pastor at Evangel. 1994 - Rev. Clarence Mitchell moved to Thunder Bay to take on the role of Evangel's pastor. 2001 - Rev. Gary Wilson became the ninth pastor in the history of Evangel Church. 2001 - The church completes an 11,475 square foot extension of the building with a gymnasium, classrooms, youth room, kitchen and upstairs residence. 2017 - Rev. Jamie Nelder became the 10th pastor of Evangel Church.